Keeping Kids Safe offers a meaningful School Fundraiser that outperforms most fundraisers while simultaneously supporting another worthy cause, the safety of our children. Children receive a Keeping Kids Safe Scratch-Off Card. Th is card is to raise funds for your school’s extra activities and other programs. Donors can scratch off a space and make a donation for the amount shown in that block. They may also donate more than that amount if they wish. Spaces range from $.50 to $3.00. Each card is valued at $100.00. Your P.T.A. or School will receive half, $50.00 dollars per student if this is fully completed. Your child will have two weeks to have friends, family, neighbors and others complete his/her card. For example, if 200 children returned in full completed cards, $10,000 would be donated to that organization. We will come to your school or Organization and preform our Presentations for FREE !! its a WIN,WIN !!! 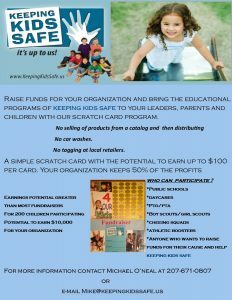 You get Free Presentations and make money for your cause plus at the same time helping Keeping Kids Safe!! !